Last week, I ordered the fabric I want to use for a diaper bag. I only ordered the exterior fabric because it was already SO expensive. And I needed over 3 yards of fabric for the interior, and I knew I could find something at the local store. The fabric on the left is the exterior (and, of course, it’s a pattern by Amy Butler, which is why the fabric is so outrageously expensive.) 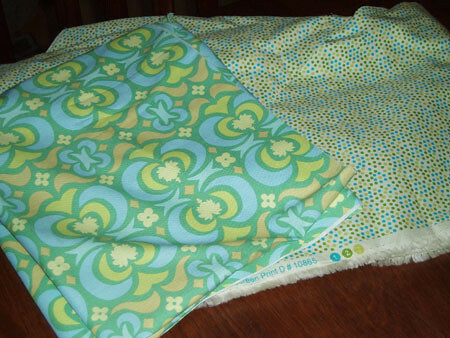 The fabric on the right is what I bought from Hancock Fabrics, and it was on sale for less than $5/yard. The blue and green shades actually match, which is what I thought would be difficult to do. It’s girly enough (for me) and boyish enough (for the baby.) I love it! The pieces are cut out and now I just need to sew them together. I’m hoping it will be completed this weekend! I LOVE the fabric!! Great match! What pattern did you decide on?